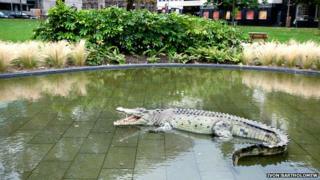 Police are investigating the theft of a 12ft fibreglass crocodile from an Edinburgh square. The sculpture is believed to have been stolen from the gardens in the centre of St Andrew Square between 14:00 on Thursday and 08:00 on Friday. It is owned by the National Library of Scotland. It is believed to have been removed via the west gate of the gardens and onto George Street. Police are appealing for witnesses. The crocodile was St Andrew Square to promote the National Library of Scotland's current exhibition celebrating the African adventures of the explorer David Livingstone. The life-size replica has been named Davy by staff. They are now very keen to get him back. Darryl Mead, National Library of Scotland's deputy national librarian, said: "Davy has proved a popular attraction in the gardens since he moved in three weeks ago. "We suspect he may have been taken as a prank late at night and we appeal for his safe return." The crocodile was filled with sand and weighed around 180 kilos to make it difficult to move him. The sand was removed before he was taken which would have taken some time and it would still have needed at least two people to carry him off, said police. He went missing when the garden's gate were closed to the public. PC Caireen Stewart, of Police Scotland, said: "This crocodile is the property of the National Library of Scotland and is very unique. "Due to its size, it is believed that someone may have seen something regarding its disappearance."